Another title which is sadly currently lost. 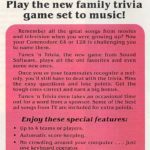 Highlighted by Peter Weighill, Tunes n Trivia was a pop quiz game released in the USA and which seems to have only been sold via mail-order. As a result, the game could have had a very limited release overall.